Round-leaved dogwood (Cornus rugosa) ? This photo was taken at the little park, Bank St and Holmwood, May 19, 2008.
green, not really with purple 'stains' as it is said to be. No red anywhere. same day. But some red osier dogwood branches are just as green. 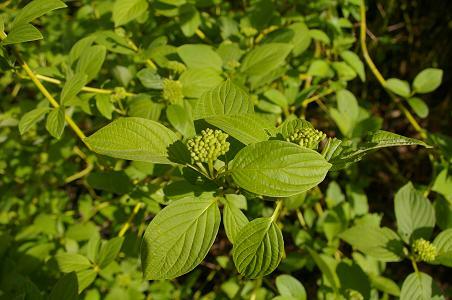 It could be a cultivated dogwood of another type.